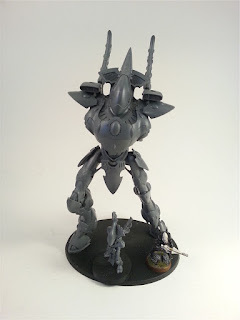 Legio Minimus: Wraithknight WIP...Part 1! I don't normally post work in progress shots, especially not shots of model building unless there is a major conversion but I just have to show this guy off. I remember seeing that the Wraithknight was coming out and just assuming it would be $100 Canadian just like like the Riptide so naturally I was outraged when I saw it would be $140. Now I finally get it as this kit is freaking MASSIVE lol. In pictures you just can't grasp the scale of this model when compared to everything else so I threw in one of the new Wraithguard and a Guardian on his base just to show off his size. This is the Wraithknight at about 4 hours of work and at this point I still haven't touched his arms or his base. It took another hour to build his two Wraithcannon arms and I am hoping to start the base shortly as well. I am leaving him in pieces (legs, body, head both arms) until I get those pieces painted as he is just way too large to paint all in one shot without an airbrush. This weekend I will start painting him and I will take WIP pics and post them here.